Daily milongas, tango concerts, individual tango clothing by local designers, tango festivals and Argentinean cuisine- Barcelona offers a lot for tango dancers and for everyone who simply loves tango. 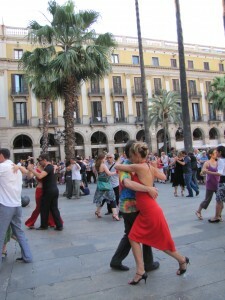 But you have to know where to find the hotspots and hidden places to live the full experience of tango in Barcelona. La Ruta de Tango en Barcelona offers advice- it is city map and tango guide in one and gives an overview over the tango community and culture of tango in Barcelona. If you follow the insight paths of La Ruta de Tango en Barcelona, it will also lead you right to UP-Tango Barcelona Fashion Design. 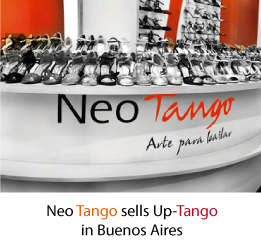 The fashion label for tango clothing and dance dresses presents its collection of dance wear in a private showroom in La Guardia 14 near the famous shopping promenade Las Ramblas in the city center of Barcelona. If you want to try on the whole variety of tango dresses, dance skirts, tango trousers and tango tops, come to visit the UP-Tango showroom on Saturday during the opening hours from 12am – 8pm. Meet the designer and receive personal advices on tango clothing and dance wear. The whole dance dress collection is also available online on www.up-tango.com.